How to change compressor oil? On these pages I will provide as much of a step-by-step process for you as I can. The process of changing compressor oil is normally not difficult. It can, however, be really messy if you are not careful. Though all oil-lubricated compressors from different compressor manufacturers may have slightly different oil change processes the overall concepts presented on these pages will work for all oil-lubricated compressors. Some of the questions you will want to have answers to before you open the compressor oil sump are covered on this first page. Does Your Compressor Even Need Oil? This may sound a bit silly, but it is a mistake easily made. Not all compressors are oil lubricated. In fact, a lot of the little DIY type air compressors now available from the big box stores are added-lubrication oil-free. they are factory lubed for life, so you cannot change the compressor oil in these compressors because there isn’t any to change. Does Your Compressor Have An Oil Sump? Oil lubricated compressors have an oil sump similar in concept to those in an automobile. It will have an oil pan. Lubricating oil that is added to the compressor flows down into the oil sump and sits there, under the pump, waiting for the compressor to start. Does Compressor Have Splash or Pump Lubrication? 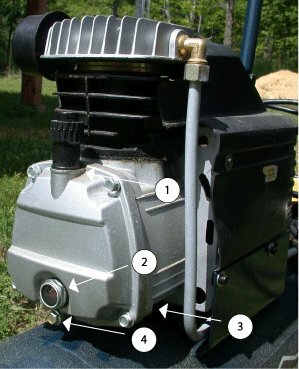 When the compressor is running, depending on the size and type of air compressor, oil will either splash up from the sump into the areas that require lubricating, or there will be an integral pump to pump the oil from the sump up to the parts needing continuous lubrication while the compressor is running. The typical DIY type oil-lubricated home compressor will be the splash lubed variety. If it is splash lubed there will be no extraneous oil pump on the compressor, meaning there is none to maintain or replace. If your compressor is designed to be splash lubed, that process works just fine. Type Of Oil In The Compressor? What oil do you use in your compressor? My rule about what compressor oil to use is simple. If my air compressor is under warranty, I use the oil that is recommended by the manufacturer and usually noted in the compressor manual. If the warranty period for the air compressor has passed, then I buy compressor lubricating oil from my hardware store to use in my compressors. For me, this rule applies my home DIY compressors only. Some of the more sophisticated and larger compressors – rotary screw, vane etc. – used by industry have very specific requirements for oil. You must use the oil recommended by that compressor manufacturer or you void the warranty or cause oil-related issues. Do not use any other type of oil in your air compressor except oil that is clearly labelled as Compressor Lubricating Oil. Compressor oil has the proper additives to make it suitable for the harsh, compressor lubricating environment. These additives are not necessarily found in automobile oil, air tool oil, etc. The additives that are other types of oils are not compatible, and in fact may damage, your air compressor. If it does not say compressor lubricating oil on the package, don’t put it in your compressor. It is recommended by your compressor manual that you change the compressor oil regularly, like you do in your car. For the DIY type air compressor user, unless you are using it all the time, follow the manual guidelines or change the oil once a year. If it is an industrial air compressor being used continuously, depending on the model of your air compressor and the manufacturer’s recommendations, consider changing the oil every 300 hours of compressor operation. Let’s get down to the process of actually changing your compressor oil, with the steps shown below. Showing compressor oil fill components. I have posted a photo of my DIY compressor, focusing on the compressor head, and the components that you will want to identify on your air compressor when it comes time for an oil change. Item #1 in the photo is the oil fill port for my compressor. It makes sense that it will be located on your compressor at a higher level than the oil drain port. Not every compressor is the same, yet all oil lubricated units will have an oil fill port of some sort, and that port will allow oil poured into your compressor to flow down to enter the oil sump located under the piston head assembly. Do yourself a favor and keep a small funnel handy when you go to pour oil back in. Otherwise, you may cause yourself a bit of a mess by spilling the oil as you pour. This is the voice of experience! Normally the cover for the oil fill port is vented. Your compressor consumes a little (or sometimes a lot) of oil as it runs, and if the port were not vented, eventually a vacuum would form in the sump which would limit the efficiency of the lubrication process. Item #2 in the photo and on my compressor is a sight-glass that allows me to peer into the oil reservoir to see how full (or empty) it is. 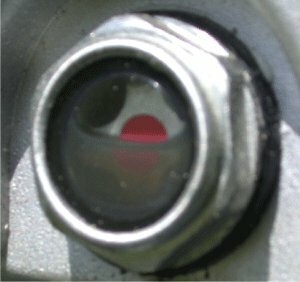 On my compressor, and typically on others with a sight glass like this one, the recommendation is to keep the oil full to the center of the red dot. Your compressor too must have some method of determining how much oil you need to add to top up your compressor sump. If not a sight glass like the one in the photo above, then the cap of your oil fill port may also contain a dipstick. Other compressors have no sight glass or dipstick. Folks generally add oil to the bottom thread of the oil fill plug on these types. Overfilling the oil sump will lead to maintenance issues for your compressor so avoid that if possible. If overfilled with oil, drain some out before powering on the compressor. You must keep the oil level topped up (the cheaper the oil-lubed compressor, the more oil it uses, it seems) and you must not overfill it. Item #3 in the photo above points to the compressor casing, inside of which is the oil sump. The bigger the compressor, the more oil it will need, of course. Mine only holds a few ounces, so I take real good care not to overfill, but at the same time, I check the oil level every time I go to turn the compressor on, as it doesn’t take long for it to go through those few ounces of oil, either. Item #4 in the photo above is the drain plug. Removing this plug will allow the oil to flow out of the sump. Some compressors (the more expensive types I think) actually have an extension on the drain port to allow easier collection of the oil. I’ve used a flat cake tin that slides in under the drain port. Or, you can fashion a drain funnel from a sheet of tin foil (folded a few times to make it more rigid) to help the oil to run into a catch bin of some sort. Draining the compressor oil can get really messy if you don’t contain the flow of used oil, and it is a witch to clean up. Take a care. These are the steps I take in changing my oil. Like a car engine, the oil in the compressor will run easier if it’s warm. Leave the compressor sitting in the sun for a while before you start the job, or let it run and fill the air tank before you start. Open the fill port to allow air to flow more easily down into the sump. Position your drain catchment / funnel or whatever you’re using to help contain the oil, and carefully open the drain plug. You want the oil warm, but it might be quite hot, so take care. My compressor has a handle on the front, so when the oil stops flowing out of the drain port, I lift the front of the compressor to help void the sump of any residual oil. Replace the drain plug, and wipe any oil residue from the surface so that you can see if you have a leak. Pour fresh compressor oil into the fill port to the specified level for your compressor. Replace the oil fill cap. The waste oil is considered hazardous waste. Be environmentally conscious, and dispose of it in a proper manner won’t you? A question about How To Change Compressor Oil? Please add you comment here along with photos to help others help you with your compressor and equipment problem!